This super package deal combines the 1617EVS motor with a plunge base and fixed base to handle a wide range of routing applications! I recently added the Bosch 1617EVSPK and the Bosch RA1054 Deluxe Router Guide to add to my arsenal of (4) routers. 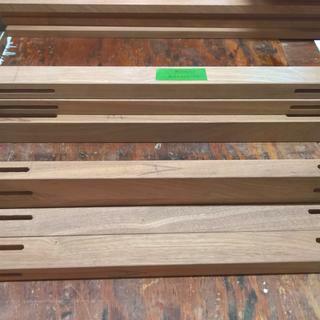 I used this new combo to route 24 mortises in 2” mahogany table legs (see attached pictures) using a 3/8 upper cut spiral bit with a 3/8 shank (had to purchase a 3/8 Collet Chuck). The Depth rod fine adjustment knob proved to be very accurate and held in place during all plunges to EXACTLY 1 1/16” deep. The router plunge handles were also very helpful to control the router - I had to keep side pressure on the router guide with my right hand and push pressure with my left hand. I don’t think I could have done that with accuracy using round handles. The plunge lever and on/off switch are perfectly located for plunge routing. The router maintained continual speed and never burned the wood. The micro adjustment on the Router Guide was invaluable in locating the EXACT center of a mortise, especially in the through mortises where I had to plunge from both sides. The Router Guide held all adjustments accurately for all 32 plunges. It took a few plunges to get used to the plunge lock lever (it locks automatically) but is a very safe way to lock a plunge. I don’t think I will ever use my other plunge routers that do not have this feature. I wish this router sub-base had two square sides instead of one round and one square (although all my other routers have similar sides) this would be very helpful when using Start and Stop blocks. Also, the EVSPK did not include 2 wing knobs to hold the guide rods in place (no big deal, I made my own). I give both these products 10 stars! Excellent Router would highly recommend this Bosch router package to anyone needing a plunge router and a standard router. 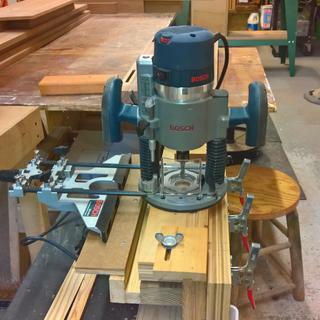 I have owned a 1617 Bosch router for several years and it is in my router table and has performed very well with no problems. I am very pleased with the quality of the router. Using this router I can tell it is built better than most. The soft start is also a great option. Even though it doesn’t have a lock for changing collets this is a great router. I haven’t used the plunge base yet, but the fixed base is great in my Bosch benchtop router table. It easily and precisely adjusts with a T handle wrench through the top of the table eliminating the need for a lift. The router works very well and I really like the soft start. I would recommend it. All the quality and ease of use that I have come to expect from Bosch. Would recommend for any serious woodworker who whants affordable quailty tools. Very quiet router. Worked really well with MLCS router bits I purchased. Loved the variable speed. I haven't been able to take a picture. Only finished the routing last night. Still need to sand and assemble. But so far the best router I've had. I am very happy with this router package. It is relatively light, and very quiet, compared to my previous routers. 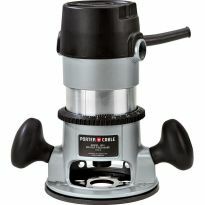 I've used it for hand routing, a little work with the plunge system, and now have it on my router table. A great tool. Powerful, steady and easy to calibrate and adjust. Wish I had had it ten years ago. This is my first quality router, I have owned a couple of other cheap ones in the past. I am very happy with the choice, it seems really easy to work with and adjust. There is a lot to like about this unit. If I had to say one thing I thought needed to be changed, the plunge base is a bit stiffer than I expected but completely manageable and will likely soften up with use. if you are new to routers I would have to say you cant go wrong with this unit at all, I would buy it again in a heat beat. Wonderful piece of equipment. Fast and easy to use. I looked at several routers and studied reviews. Although there are less expensive routers this is a tool that needs to perform. Bosch routers are superior in quality and at a professional level. Even the case it comes with is of great quality. This is the right choice in routers for anyone and I would recommend purchasing this one over any other. I love the soft-start and smooth operation of this router! Like all the Bosch tools I've owned before purchasing this router, it appears very solid and well built. Accuracy in all points and adjustments seem flawless and well-fitted. The ergonomics are perfect for me, providing great comfort during use and the power provided is ample. I recommend this router highly. I was looking for a precision router that could be used in a router lift, and this is an excellent choice. Soft start, variable speed, very smooth and quiet, with both 1/4 inch and 1/2 inch collets. It's a Bosch.... nuf said!! Well built machine. Smooth and sturdy, and easy to use. Love the micro adjuster. I'm looking forward to learning more and getting the most out of this, my first, router. Great router at a very fair price! One of the best routers I have used! Good balance and plunge feature! The router runs smooth and has the power I need to do some of the big projects I work on. Very pleased with the router. Wish this router had a trigger on the handle so you wouldn't have to move one hand to start. Other than that, a fine product. Great router and very functional package. Two years ago I bought a Festool OF 1400 and gave away a Bosch router with a different model number but the same specs. Controls are easy enough to access but suggest some additional lube for the plunge function. As I would expect from Bosch, this router is very well made. The machining is precise and fits very smoothly. The handles and the feel of it is excellent, and it is easy to control. The only less-than-stellar aspect of it is the on/off switch. I have to remove my hand from one of the handles to turn it on/off, which opens of the possibility of it shifting slightly at the beginning or end of the cut. This is a concern mostly at the end of a plunge cut. Other than that, this is an awesome machine. Great router except the quick change template bushing adapter kit can be installed incorrectly and not work well. Coming from a porter cable this was a huge disappointment since it could so easily have been installed incorrectly. The mistake cost me a piece of larger piece of 8/4 purple heart. this is the sort of router i need and its on sale! Meets my requirements for what I need to do. The reviews on this are stellar. 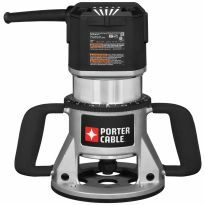 It has strong motor, can handle 1/2 inch bits and is compatible with just about all router plates and lifts. I had it before and it was stolen. Is great for what i do. It’s Bosch and it’s sold by someone I trust. 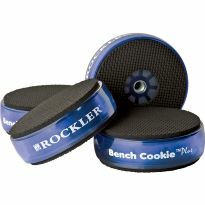 I know Rockler will make things right if ever a problem occures I feel secure with Rockler. Plus I don’t need anything larger,the one I chose will be all I need. Quality of router as a combo kit and price. High reviews. Ability to raise bit from top of router table. Highly recommended from several sources. Both fixed and plunge base package. Great price! Like the reviews on this product. Had been shopping around for months on this particular router. Free Ship! Best router for the money - was also in sale which was a bonus. I need a new router. Bosch has an excellent reputation for quality, this model had the features I want, the reviews were excellent, and it was on sale! Widely acknowledged as one of the best routers for use in router tables. The package also comes with a plunge attachment, so it becomes dual purpose. It fit my router lift and a good brand. Previous experience with bosch tools, reputation and reviews. After researching this is best utility router for small jobs out there. I watched this complete YouTube review from Workshop Addict, "Bosch 1617 EVS 2.25 HP Variable Speed Router", then purchased based on his comments. I have used this router for many years in my shop and it is time to replace with a new one. I have several Bosch tools and they are well designed and dependable. This router package is flexible and adequately powerful for my needs, and I have been waiting for it to go on sale! After a lot of research this router fits my needs and is very vesatile and easy to use. 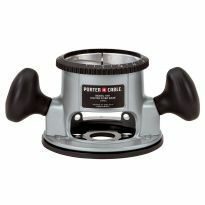 Purchased primarily for use in a router lift, but the plunge base would be useful for other specialty routing tasks. Very versatile router package. The 2.25 HP router is powerful enough from most general purpose routing needs. After reading the reviews I decided to go with Bosch. I like the interchangeable bases. This router runs like a dream and is very comfortable in the hands and easy to control. 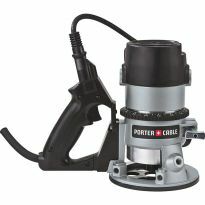 I do many projects and have wanted a plunge router. Met my needs at a good price. Know others that have this router and are happy with it. 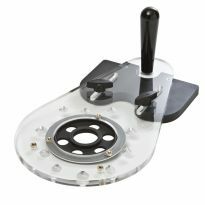 When used with router table, just how good is the above table micro adjuster as opposed to using a router lift kit? Is it good enough to perform style and rail work for cab doors? What plate type would I need if I have a Bosch 1617EVSPK Router Combo, and want to use the fixed base in this table? (I can only see the Bosch 1619 and MRC23 Series routers listed.) Thanks! BEST ANSWER: If I'm reading it right, bosch 1617 is listed right after the MRC23 under Plate A. 1617, 1619 both use the same base.. It is posble to get this router 220 volt? BEST ANSWER: Given this is a U.S. model, my first inclination is that it isn't available as a 220V model. However, Bosch is a European company, and I did find some information on the Web for their model Bosch 1617.161. That model looks similar to this one and it might be possible to add the plunge base as an accessory if you have a need for it. Ultimately, I would suggest checking with Bosch for any information on 220V versions of this router combo. 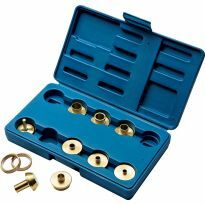 So I bought this router and went to put rockler guide bushings for sign making in the plunge plate and realised they are much to small. My question is what plate would I need to get to house the guide bushings on the plunge? 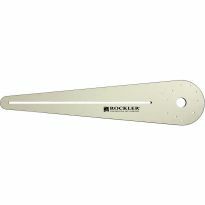 BEST ANSWER: You'll need http://www.rockler.com/bosch-template-guide-adapter-ra-1126 and http://www.rockler.com/bosch-ra-1100-template-guide-adapter-adapts-pc-template-guides-in-bosch-routers to use those guide bushings. This comes with both a 1/4" and 1/2" collet? They are easily interchangeable? yes it does come with both collets and they are very easy to change. Does this type of plunge router work good for creating bowls for a baseball display? I have not used the bases I bought the router to use on my CNC Shark and it has worked very well. 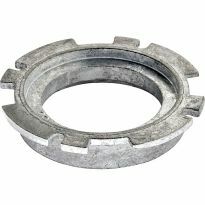 Is the Bosch 1617EVSPK Router (item # 62716) compatible with the CNC Piranha FX (item # 52995)? 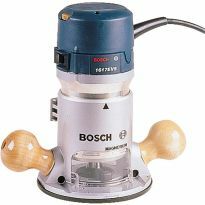 BEST ANSWER: The Piranha Fx is not capable of utilizing the Bosch 1617 router.